This is a fascinating book, full of facts and figures about British protest movements from the Peasants’ Revolt in 1381 to the anti-Iraq war demonstration of 2003. It also gives voice to some of the lesser known protests over the centuries. Each author was asked which protest movement they would like to write about in order to be paired with an expert, to learn all the salient facts. The authors then wrote a short story, bringing the history to life not with usual famous people from their era, but with ordinary people trying to survive in extraordinary times. Each short story also has an accompanying essay by the expert, to put the events in context and explain the wider ramifications. As a structure it works well, lending breadth and depth to the fictionalized version of the protest and illuminating the reasons for the events. There is a distinguished roster of authors, including Kit de Waal, Alexei Sayle, Kate Clanchy, and Frank Cotterell-Boyce, and the time frame is chronological. While this is an easy book to dip in and out of, reading it from page one onwards rewards the reader with an overview of the history of British protests, and a sinking feeling as the same issues come up again and again. The poor and dispossessed often protest to their lords and masters about their harsh living conditions; kings and the nobility burden their serfs with extortionate taxes; a legal system is skewed towards the rich and powerful; and men and boys are forced to go to wars they did not start or understand. Highlights include Sara Maitland’s ‘The Pardon List’, about Wat Tyler and the Great Rising of 1381. A woman defends her looting and destruction at the Savoy Palace, insisting she has done nothing wrong and has no need to beg for pardon. Professor Jane Whittle’s essay explains the background to the rising, and the fact that a lot of the rebels were reasonably well off craftsmen and town dwellers and not a horde of ignorant peasants. Laura Hird writes one of the longer pieces in the book, the excellent ‘Spun’, about the Scottish Insurrection of 1820. Sixteen-year-old Andrew White, a real person, gets caught up in the excitement of protest, only to be brought down to earth as the movement is outflanked by the military and the protestors are soon on their way to prison in Stirling Castle. Dr Gordon Pentland of Edinburgh University writes about the reasons for the insurrection which burned bright and fast. There are so many good short stories and accompanying essays here, it is difficult to leave any unmentioned. Tales by Frank Cotterll-Boyce on Venner’s Rising, Maggie Gee on the Night Cleaners’ strike, Martyn Bedford on the Battle of Orgreave, and Joanna Quinn on Greenham Common are all thoroughly absorbing and enlightening. 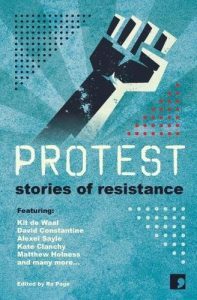 Protest is an important collection highlighting the history of dissenting voices in the UK. It teaches rather than preaches and should be required reading for many of our current politicians.